Local literary hero Ralph Waldo Emerson is often quoted as saying “If you build a better mousetrap, the world will beat a path to your door.” I recently learned that that this was a highly abridged version of the actual quote “If a man has good corn or wood, or boards, or pigs, to sell, or can make better chairs or knives, crucibles or church organs, than anybody else, you will find a broad hard-beaten road to his house, though it be in the woods.” I can understand why someone would want to summarize – but in any event he was wrong. If you offer a well designed 401(k) plan with broad investment options, low fees, reasonable vesting and a generous match will participants beat a path to your door? My answer to that after many years of developing participant communication programs for a wide variety of plans is – no they will not. A recent article by Fred Barstein of Napa Net entitled “Bloomberg Jumps Into the 401(k) Ratings Game” poses the question “Should plans be judged on what they offer or on participant outcomes?” and this is, indeed, the rub. If corporations invest in the plan itself without an eye to the programs and communications that promote diverse and robust participation in the plan the plan will likely end up top-heavy and not perform well for employees as a group or for the corporation. I remember about 10 years ago a young family friend had taken a job at a Hilton property where the 401(k) plan offered a 100% match on the first 3% deferred and participants could borrow up to 50% of their plan balance (up to a certain limit.) So, in essence if you put $100 in, they would give you another $100 and you could borrow the first $100 from yourself and pay yourself the interest. I believe I explained this while jumping up and down and waiving my arms saying “what have you got to lose? Participate in the plan!” Sadly, she did not. If she had saved $900 (about $17 per paycheck) for even one year she was there (assuming an average annual return of 5%) – she would have a nest egg of $2,968 or so now – that’s a 229% return AND she could have borrowed the original investment if she needed to. It was a great plan for which she received a folder when she was hired and pretty much no communication after that. 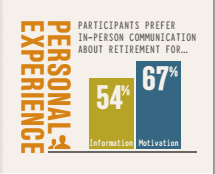 A recent study from Lincoln Financial on participant engagement suggests that participants require frequent communication – often in person. The study found that 86% of participants described themselves as anxious, overwhelmed or scared by the topic of retirement planning. You will not find these people beating a path to the plan whether it is through the woods or a brightly lit hallway. A plan is only as good as the retirement savings it generates.